An AI startup supported by technology entrepreneur Diosdado “Dado” Banatao and Henry “Big Boy” Sy Jr., son of the Philippines’ richest person, is getting ready to roll out its technology with the potential to help local business process outsourcing (BPO) service providers create new types of call center jobs amid the rising threat of automation. Speaking at the sidelines of the launching of the AIM-Dado Banatao Incubation Center in Makati City, Banatao said the startup can begin to commercially offer its technology to local BPOs and call centers in half a year. The startup, Augmented Intelligence Pros (AI Pros), was founded by Filipino-Canadian George Yang, a computer engineer who previously developed a popular computerized bingo game used in some shopping malls in Metro Manila. The startup is based in Silicon Valley in southern California as well as Manila in the Philippines. Yang (no relation to the Chinese-Filipino tycoon who bought McDonald’s to the Philippines) calls the technology “augmented intelligence,” which he says relies on human agents who work with a proprietary AI algorithm that can do complex customer interactions like what US call center agents do, including selling, marketing, collecting, and handling disputes. 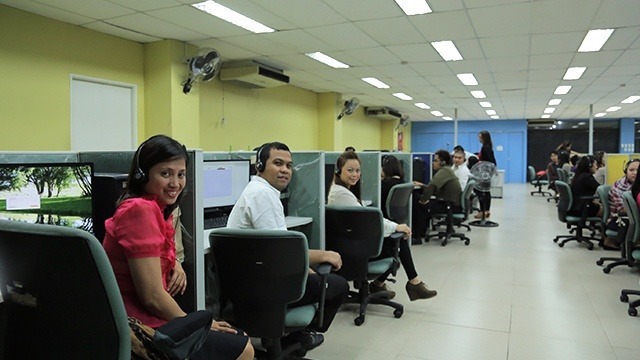 AI Pros has conducted field tests for its proprietary technology among several call centers in the Philippines. In some of the tests, both outbound and inbound call center workers who either make or receive calls from US customers to sell them high-priced cruise packages and magazine subscriptions were able to boost sales by 80 percent by using AI Pros’ technology. These type of calls are mostly based in the US because of the complex communications involved. AI Pros is now holding talks with some companies to give them early access to the technology to test it further, said Yang in a separate interview. “Some of the world’s biggest call center companies already approached me and Dado. They asked for exclusivity but Dado’s position is no exclusivity. We don’t care if you’re the biggest in the world because we want to open this technology to everyone,” he said. Yang added that they want Philippine-based companies to be the first ones to use the technology. “A very large Indian company already approached us but we want to give Philippine companies first crack through the early access program. I'm encouraging the Philippine companies first. The final decision will wait until I see all that,” he said. Most of the call center work found in the Philippines deal with inbound calls mostly from customers with queries or complaints. Inbound call center workers are most vulnerable to being replaced by robotic process automation (RPA) and cognitive agent technologies that are far cheaper and more efficient than people. RPAs and digital agents cost about a third of wages of offshore full-time employees. They are expected to displace significant numbers of BPO workers by 2025, according to a survey by the Pew Research Center. Yang added that with AI Pros’ technology, it will become possible to move high-skilled jobs to countries like the Philippines, where existing call center workers can work with AI technologies to interact with customers worldwide. While relatively low-value, low-skilled call center work will inevitably be displaced by automation, AI Pros’ technology may help create new jobs in working with the AI algorithm to interact with customers all around the globe. The BPO sector employed about 1.3 million Filipinos and generated about $25 billion in foreign exchange revenue in 2016, according to the industry association IT & Business Process Association Philippines (IBPAP). The association forecasts that by 2020, the BPO sector’s revenue could almost double to $40 billion while employment will grow to 1.7 million. Yang has been working on the AI startup since 2008 when he went to the US after several years of working with the Sy family to help them grow their relationships with US call center companies who are now some of the SM Group’s biggest tenants. He approached Banatao and invited him to invest in the venture and provide guidance on technology and strategy. Banatao is a leading Silicon Valley venture capitalist who invented some of the processors that revolutionized the computer industry in the 1980s and 1990s. He is contributing crucial pieces of technology to Yang's augmented intelligence solution thanks to his venture capital investments in AI companies such as Wave Computing and ThinCI, which are developing new machines designed to run AI applications such as vision processing and deep learning several times faster. Sy, who is CEO of the National Grid Corp. of the Philippines while overseeing the SM Group's real estate acquisition and development activities, is providing funding in his personal capacity. BPOs make up about nine-tenths of the SM Group’s leased office spaces. This article was modified on August 29, 2017 to clarify that AI Pros’ technology covers a broader set of complex interactions and not just outbound calls.